When you see dwarves on movies or hear about them in stories, what are they usually doing? They’re usually mining for jewels, right? 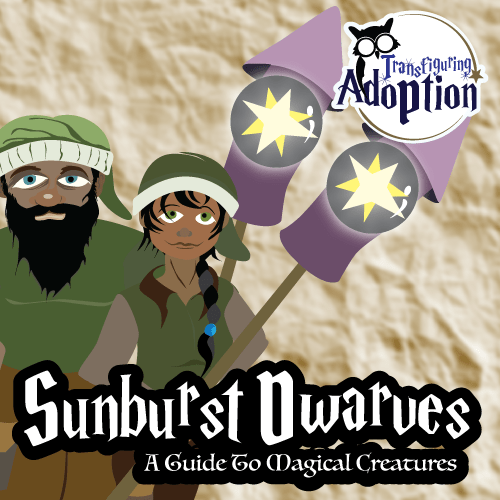 The Sunburst Dwarves are descendants of Solar the Great and his wife, Beamitrice. The two dwarves were asked to leave their jobs in the mines and given the special knowledge of making Beam Rockets by an ancient and powerful creature whose existence has been long forgotten. Solar and his wife taught their children for centuries how to create Beam Rockets. The Sunburst Dwarves continue to search the skies for falling and weary Fleet birds to this very day. They are highly respected among all the intelligent magical creatures due to the importance of their job. 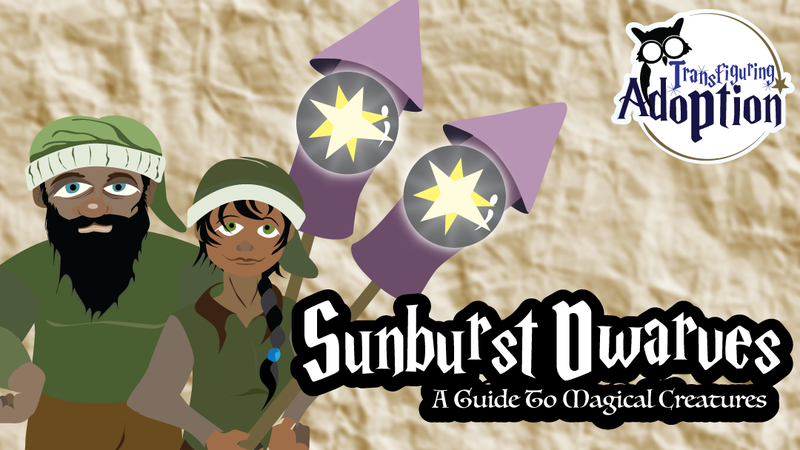 Sunburst Dwarves are human in appearance. They actually appear similar to garden gnome statues. The men are commonly 4 feet tall while the women are about 3 1/2 feet in height. Male Sun Dwarves tend to wear mining clothes like their mining brothers. Their clothing consists of a stocking cap, mining shirt, overall and a pair of thick soled boots. The coloring of the clothing tends to match the earthy colors of their surrounding. Female Sun Dwarves commonly wear their hair tied back with work clothing – work shirt, work pants, and thick soled shoes. The clothing once again matches the earthy tones of their surroundings. A monstrous bang is given off to awaken Fleet birds. The noise sounds like thunder to humans. Once the glass compartment is broken, the sunlight inside flashes around in the sky. Fleet birds can quickly eat some of the rays. The light appears to be lightning in the sky to humans. After a Beam Rocket has exploded, it creates many many dark explosion clouds. As humans believe they are hearing thunder and seeing lightning, they also think the clouds are rain clouds. Sun Dwarves are the only dwarves that have the ability to shrink down from their original height. They were granted this ability from the same ancient creature that gave them their special jobs of protecting the Fleet Birds. Sun Dwarves are friendly to humans BUT they are also very serious about their job. Therefore, they will avoid talking with people or creatures so they can keep an eye on the skies. 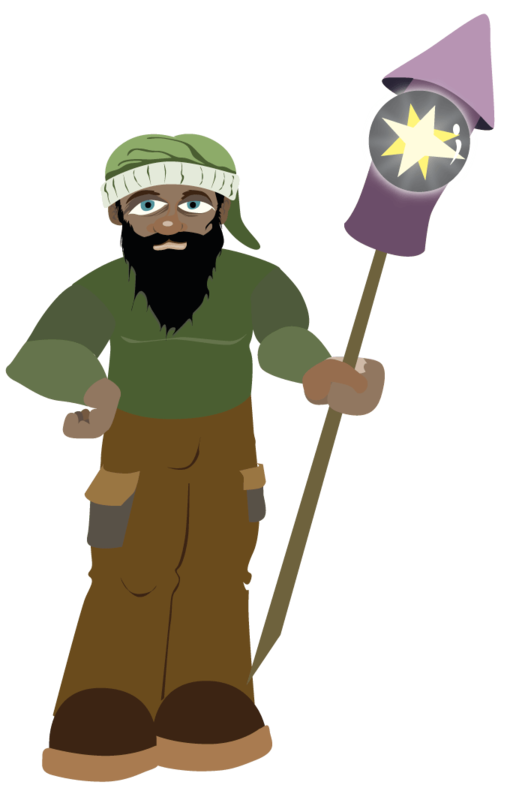 Sun Dwarves like to have many pockets in their clothing so they can hold tools to help them with their job. One never knows when an extra match, a knife, some rope and more will come in handy while trying to rescue a Fleet bird. The reason the Sun Dwarves were granted the ability to shrink is in order to hide from other people or get in cracks or niches that they need access. It should be noted that while the dwarves can return themselves to their original height, they cannot grow past that height. The dwarves cannot shrink anything that has not been made by dwarves. Just because these dwarves have a job that is above the ground does not mean they enjoy heigh places. Their homes are commonly beautifully decorated dens that are under the ground. The entrances are usually hidden and small. Sun Dwarves are very familiar with all the constellations in the sky. This is due to the fact that most weary Fleet can be seen in the nighttime hours. The dwarves also can easily spot a flock of Fleet in danger when they see them forming a streak of light like a comet across the night sky as they quickly try to fly away from the night to daylight. If your child can feel safe with you outside at night, find a comfortable area. If your child cannot feel safe outside at night, some of the apps allow you to view constellations merely by pointing your phone in a certain direction. Make sure to bring water and snacks (protein is best) while doing this activity to help keep blood sugar leveled out so that kiddos aren’t so antsy. Sun Dwarves are constantly watching the skies to make sure that Fleet Birds are not in danger of falling out of the sky. For fun we have told our kids that we are going to pretend to watch for Fleet and help the Sun Dwarves around our home. The most important part is to keep looking for a shooting star as this is sometimes a flock of weary Fleet flying so fast toward daylight that they cause a streaking glow across the sky. While you’re looking for this in the sky, it can be quite fun to learn the constellations and find any planets that are visible. We have found that kids enjoy learning the different pictures in the sky. It also gives them something to watch for in the sky when traveling in the car at night. Thanks Casey! We welcome the feedback. Please share any other ideas or suggestions you have for our creatures.